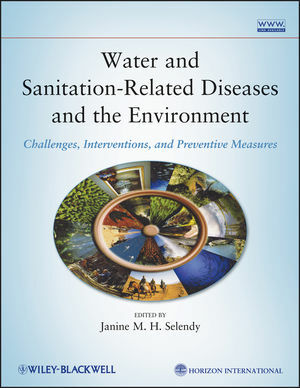 Written by authorities from various related specialties, this book presents the most complete treatment possible of the conditions responsible for water- and sanitation-related diseases, the pathogens and their biology, morbidity and mortality resulting from lack of safe water and sanitation, distribution of these diseases, and the conditions that must be met to reduce or eradicate them. Preventive measures and solutions are presented throughout. This book is an essential resource for all graduate students, postdoctoral scholars, and professionals in infectious disease, public health and medicine, chemical and environmental engineering, and international affairs. Janine Selendy is Founder, Chairman and President of HORIZON International, a non-profit organization based at Yale University, which addresses health, anvironment and disease issues worldwide. She also serves as principal editor and publisher of Horizon's web-based Solutions Site. She is executive producer of more than 20 television documentaries, many of which have won awards and have been broadcast in many countries. She is also a Research Affiliate in the Department of Molecular, Cellular and Developmental Biology, Yale University. Her background in medical, scientific, environmental and other areas provides her with an appreciation of the interconnectedness of many subjects.